Turf toe is a sprain of the joint at the base of the big toe, caused by a very vigorous upward bending of the big toe. Symptoms include sudden onset pain in the joint, with swelling and tenderness under the joint. Immediate first aid is to apply the PRICE principles of protection, rest, ice, compression, and elevation. Symptoms include pain and swelling at the joint of the big toe and metatarsal bone in the foot. Pain and tenderness will be felt when applying a stretch to the ligament by bending the toe or pulling it upwards. The ball of the foot is usually very tender when palpating (pressing in). It is important to compare the injured foot with the uninjured one when assessing the injury. A full diagnosis may not be possible without a scan, such as an MRI, although this is not usually necessary, except when appropriate treatment has been unsuccessful. 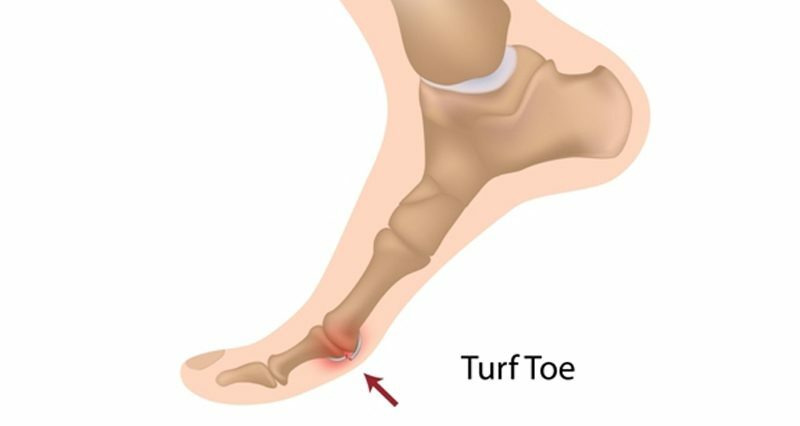 Causes & anatomy: What is turf toe? The forefoot is made up of the long metatarsal bones which connect to the phalanges bones (which make up the toes). 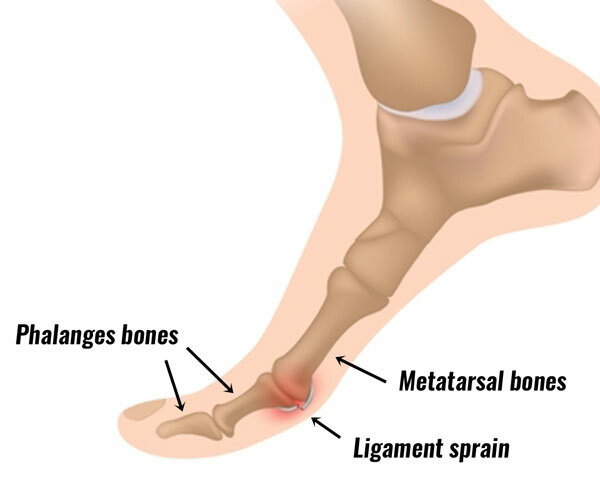 The point where the metatarsals attach to the phalanges is called the metatarsophalangeal joint or MTP joint for short. The bones are joined together by ligaments (a short band of tough, fibrous connective tissue). Turf toe is simply a sprain to the ligament at the base of the big toe or great toe. A sprain is simply a tear or overstretching of a ligament. It can be caused as the shoe grips hard on the surface and sticks causing bodyweight to go forward, and so bending the toe up further than its normal range of movement. Turf toe is also common in team sports played on artificial, grippy surfaces, as well as in martial arts where fast, explosive movements are made in bare feet. You are more at risk if you have an increased range of motion in the ankle and/or wear soft flexible shoes which fail to give enough support to the forefoot. When the toe is bent/forced upwards this stretches the ligaments under the toe which can become overstretched or torn. Occasionally the surfaces of the bones at the joint can become damaged as well. An X-ray or MRI scan is usually recommended to check that there is no fracture present. If the pain in the joint at the base of the big toe (MTP joint) comes and goes, lasting for around at a week at a time, with no obvious cause then consider gout as a possible cause of the toe pain. Gout is a form of arthritis caused by a build-up of uric acid within the body and is more common in men aged 40-60. Treatment for turf toe is based on immediate first aid, reducing symptoms of pain and swelling, then gradually returning to fitness when pain allows. Apply the PRICE principles of protection, rest, ice, compression, and elevation. Protect the foot from further injury by stopping playing or training immediately. Apply ice or cold therapy to the area as soon as possible. Applying cold therapy or ice to the injured joint will reduce pain and inflammation speeding up the healing process. Apply a compression bandage to help support and protect the toe as well as reduce swelling. The sooner a compression bandage is applied the earlier it will prevent swelling although a compression bandage should only be applied for 10 minutes at a time or it may restrict blood flow to tissues and cause further damage. Rest is very important. This might include using crutches to take the weight off the toe. It is difficult to rest the foot when you need to walk on it but without rest, it will take much longer to heal. Use a brace to protect the toe or at the very least wear a shoe that has a firm sole that will not allow bending. A turf toe taping technique will support and protect the toe preventing it from bending in the direction that will stress the ligament causing pain. Taping will also help protect the ligament when returning to full fitness, especially if the ligament has been overstretched causing joint laxity. How long will it take to heal? See a sports injury professional for advice, especially important if the injury is severe or doesn’t heal as expected. A doctor or sports injury professional will assess the injury and make an accurate diagnosis. They may x-ray the toe to check for complications such as a fracture. A broken toe may have similar symptoms to a severe turf toe injury. They may use ultrasound or other electrotherapy treatment to help reduce pain and swelling in the joint and aid the healing process. A physical therapist or similar will advise on a rehabilitation and strengthening program if required. General foot and toe exercises may be required to strengthen the injured foot depending on how long the athlete has been non-weight-bearing. Recovery of this injury can take three to four weeks depending on how bad the sprain is. After 2 to 4 days the athlete may be able to weight bear again but pain should always be the guide. If the athlete does not look after this injury then it may develop into hallux limitus/hallux rigidus, which is a stiff joint with a decreased range of motion due to arthritis around the joint. This can cause problems in the rest of the foot or lower limb due to changes to the natural walking cycle (gait). The aim of taping for turf toe is to protect the MTP joint by preventing it being bent upwards. This is done by applying support strips of tape underneath the joint. 2.5cm (1 inch) nonstretch zinc oxide tape. 3.8cm (1.5 inches) nonstretch zinc oxide tape. Apply a strip of 2.5cm tape around the big toe as an anchor. Anchor strips of tape are used to form a stable attachment point for the supporting strips. Use two strips if the big toe is long. Using either 2.5cm or 3.8cm tape apply two overlapping strips around the middle of the foot to provide a second anchor point. When applying the anchors to the middle of the foot, spread the toes apart to simulate load bearing on the foot. This will help prevent the tape from being uncomfortable when the athlete stands up. Apply a support strip of 2.5cm tape from underneath the middle of the foot, directly up to the big toe. Ensure the toe is in the desired position before fixing the tape. This should be in a relaxed, neutral position and not bent upwards as this is the movement we are attempting to restrict. Some therapists prefer to tape from the toe downwards but either way works as long as the anchor points are secure. Apply a second support strip from the middle of the foot upwards but slightly to the side and overlapping the first. Then apply a third support strip from the other side. If done correctly this should give an ‘X’ shape of tape with the cross passing under the metatarsophalangeal (MTP) joint at the base of the big toe. Secure the support strips with two strips over the top at the big toe and the middle of the foot with 2.5cm and 3.8cm tape respectively – like the original anchor strips. Assess the turf toe taping to ensure the big toe cannot be bent back and the tape is secure.